YOUPI is the second premium theme from the Alexbranding team, created the most technologically advanced for projects, in which the owner expects the maximum return and is ready to use the most modern solutions of influencing the buyer. 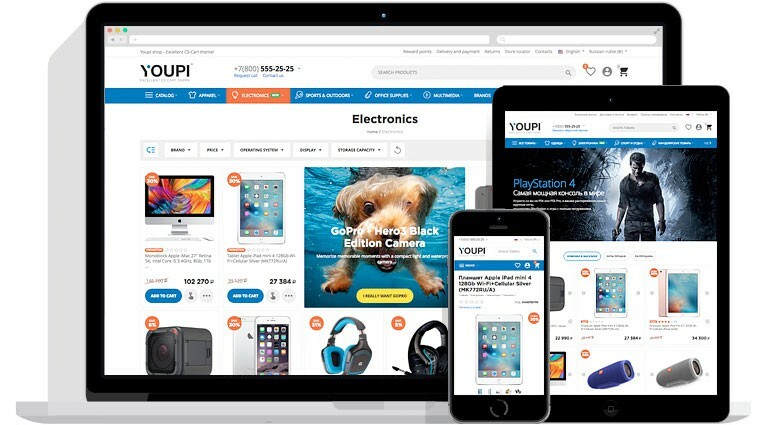 YOUPI is not just a template for CS-Cart, it's a software package, that makes the platform (without that powerful) the most effective in terms of sales, SEO, technology and usability, informative and responsive on different devices, including mobile. The basic concept of YOUPI is the creation of a kind of hybrid online and offline store, where the user receives high-quality advice and assistance in choosing products, necessary for him (previously it was very difficult to do, and now this is a reality), the shop maximally involves the user in the commodity lists through an innovative system, allowing to display information blocks (banners with various types of information) right in the product grid. The design is created in such a way, that the user is completely immersed in the choice of the goods and nothing hinders him, but only helps. Further, having made an informed choice, the buyer goes to the product card, where the store "loads" the buyer with suitable additional products, supplementing his needs, maximizing your check. When buying YOUPI, you do not need to pay the cost of these modules separately (all included). This system opens up simply incredible opportunities for using consultations directly in the listing of products: users no longer pay attention to standard banners in the expected places and promises directly in commodity tiles are working, this is a trend solution. Clothes - you create an article in a blog that shows how to look fashionable, insert a video from a fashion show, make a description and associate the products, that can be used to achieve such a bow (and a fashionista on one page sees the entire set that she must buy , so to look or appear). Cosmetics and care products - create an article "How I remain young in my 70 from famous star" and attach the recommended remedies that she uses. Such examples can create an infinite number. This functionality will automate the process of advisory sales, which was previously considered impossible for Internet trading! Use your expertise 1 time for thousands of sales. The more you make such inclusions, the more interesting your catalog will be, more time the user will spend in it, more purchases will do. Also you can specify styles and design for all elements of the banner or use the built-in presets for the already thought-out placement of elements. This is the best solution for operational management of advertising banners of the store from the available on the market. After installing the template, you can download demo banners automatically and work with the already created demo content, which will speed up the development and integration. Youpi by default gives on all pages the micro-markup, which is necessary for the online store: the markup of the organization (the field designer), the markup of the product (+ reviews and ratings, brand and images to standard markup), bread crumbs. Using of microdata improves indexing, influences search results and the clickability of a site in search results due to the use of extended descriptions of pages in snippets. Used transmission technology JSON-LD (universally readed by all search engines without errors). The horizontal menu has additional adaptation and the ability to place in an unlimited number of elements of the first level (the mechanism of scrolling the next batch of points on the scroller principle is implemented). Now stores with a large category structure can use the horizontal menu without problems. Thus, you get a "machine" for the content promotion of your store. Create a blog post, attach a video and a selection of recommended products and get a recommendation, that can be shown by the banner in the category (for which it is made) then this is a guaranteed sale. Since in fact this is a consultation - a recommendation, the same, as in an offline store, only its advantage is that, you create it once and it works thousands of times. This is an unprecedented efficiency! These recommendations are well done for specific search queries, then you get more organic traffic from search engines and guaranteed sales growth. Editing of settings of the section in layouts, you can make, that all the blocks, that are in this section, will be displayed in tabs (YOPI uses this mechanism on the main page). Special mode allows you to save your resources, because when you load a page, the tab data is obtained only when you request a tab display. This allows you to display a lot of content on the pages, but spend a little resources. A distinctive feature of the YOUPI template is work on all possible devices from 320 pix of the phone to the widest PC screens. This provides excellent conversion rates for stores, that use it. 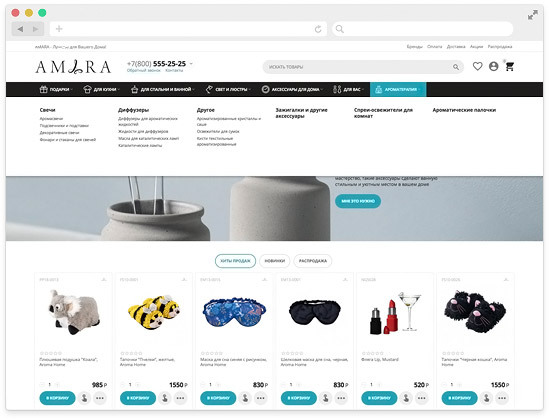 The theme improves the native work of CS-Cart with wholesale prices, optionally showing in the list the availability of the wholesale price for products in list. This approach allows you to squeeze the maximum of sales from products lists: the user is always interested in the minimum price - this is a natural desire of the buyer to save. 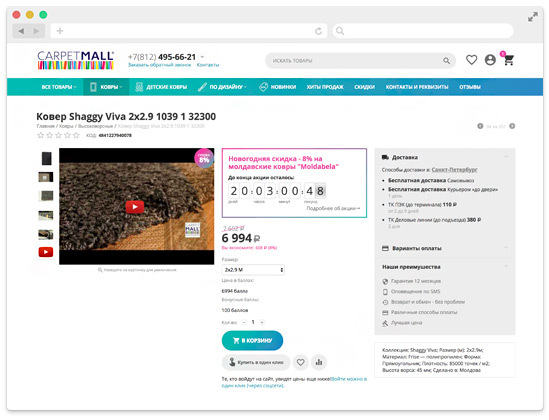 YOPI uses this factor to maximize the user's involvement: already in the catalog, he sees that he can save a hell of a lot by purchasing a certain amount of goods (and just 1 click to view the wholesale conditions). YOUPI can download images after page will be shown to user, it speeds up categories pages. In the product tab management, YOUPI adds a new option for the tab - Hide part of the contents of the tab. This option allows you to flexibly include the "More" or "More Details" button, by clicking on which the full content of the tab is displayed. Developers guarantee the correct working of the theme on a non changed CS-Cart installations with all recommended settings (styles, layouts, blocks, required addons), changing any states can entail additional work from the integrator. Guarantee support for highly customized templates is not implemented by the developer. Before installing the theme, disable all third-party addons and modifications, get the demo theme to fully match, and then proceed to step-by-step activation of third-party addons. Always test work, updates and other changes on the dev version of the store. When ordering, specify an additional subdomain for testing the work of the theme on the dev version (it's free) (just specify it through a comma along with the primary working domain). The best solution for updates, if you are not an experienced integrator, is deleting the old version (with cleaning the repositories of the modules and templates to be deleted) and installing a new version (!!!! allways do backups for DB and files of your store). Use the theme only on those domains, that are inscribed in the license (do not violate the license terms). В настоящее время наш сайт находиться в стадии наполнения, но уже сейчас виден еженедельный рост позиций и посещаемости. Love the YOUPI theme. Great Features and easy to use. This is a very strong theme ! Might be the future standard for a Cs-cart theme. People might say it's pricy but all in all this is a theme with so many possibilities ! - SEO addons are really usefull with the possibility of import/export through csv which is quite usefull. - Cross & upsell which seems basic but is really well built into the theme. - Design is easy to customize. - Really impressed with the product view ! - Support is great ! - Import export for all addons (Banner in product listing with positions, cross & upsell, ...) I've stores with more than 600 categories each which make management easier through csv import export. - fixes the small bugs remaining but that is already on it's way so ... Nothing to add there. Не совместим с AB: UniTheme!!! Можно включить только один из двух. И нигде об этом не заявлено (пропустил?)! А между тем нужна поддержка сразу двух - на одной витрине один, на другой другой, магазины не клоны и все довольны! А как будет работать с MultiVender ? А на шаблон взглянуть то можно? 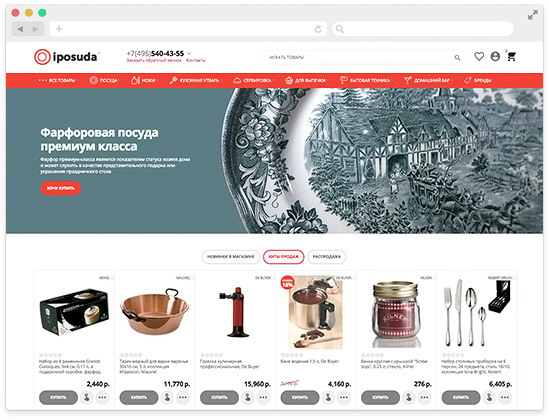 Internet supermarket for the sale of ideal dishes and kitchen utensils from the most famous brands. The project was implemented on the basis of the innovative, premium template Youpi for CS-Cart. Internet shop of Apple's original technology, gadgets and accessories at affordable prices. The project was implemented by the customer independently, based on the innovative, premium template Youpi for CS-Cart. 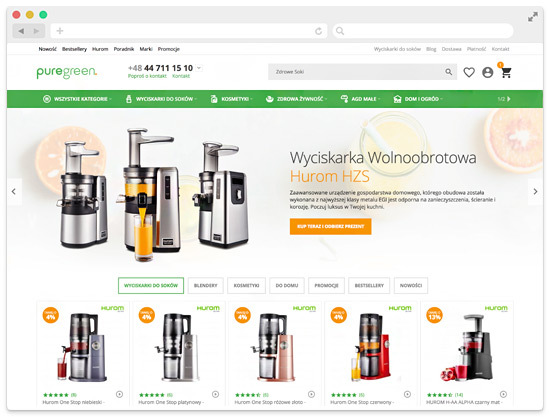 Puregreen.pl - official store of Hurom. Sphere of activity - juicers, home furnishings, food and cosmetics. The project was implemented on the basis of the best UniTheme theme for CS-Cart. 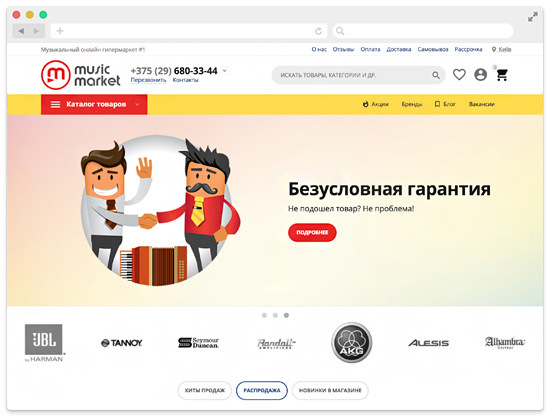 The first online hypermarket of musical instruments and equipment in Belarus! The project was implemented on the basis of the innovative, popular template YoupiTheme for CS-Cart. 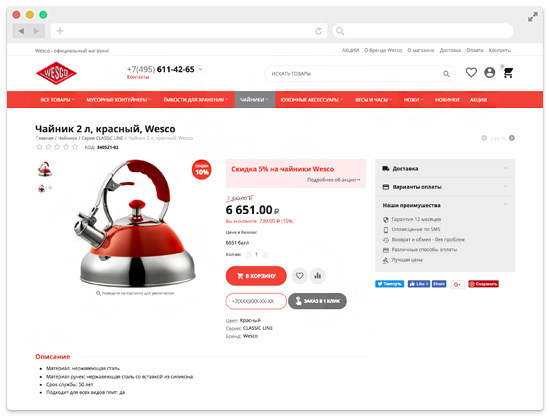 Official in Russia online store WESCO - bright, stylish products for home and cuisine from Germany. The project was implemented on the basis of the latest, premium template YoupiTheme for CS-Cart. "Lights of the House" Internet-shop of lighting devices for the house, office and dacha. 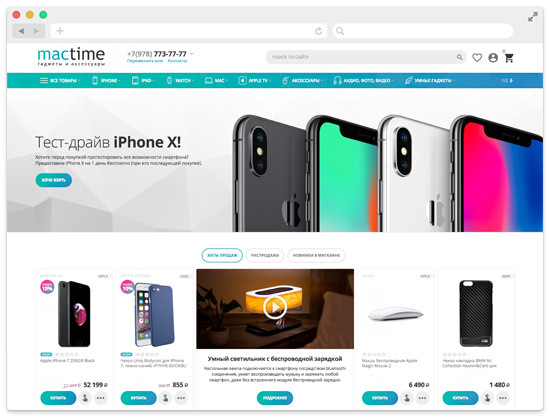 The project was implemented on the basis of the popular, premium template YoupiTheme for e-Commerce platform CS-Cart. E-shop of elite and professional cosmetics and perfumery. The project was implemented on the basis of the innovative, popular theme "Youpi" for CS-Cart. Online store with a large assortment of carpets - Сarpetmall. The project was implemented on the basis of the innovative, popular template YoupiTheme for CS-Cart. Internet store AMARA - the best products for your house! 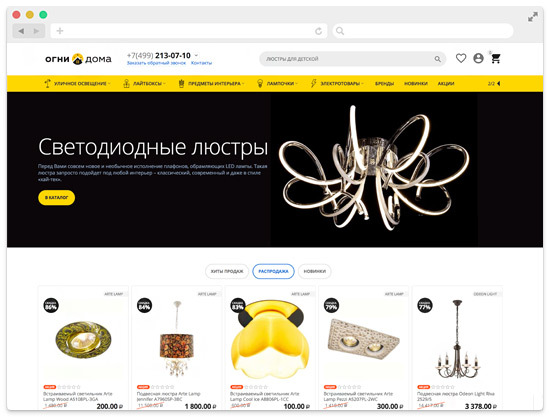 The project was implemented on the basis of the innovative, premium theme Youpi for e-commerce platform CS-Cart.